This information has been taken directly from Travelaid, with permission. From late december to march. The rest of the year, there is too much snow to walk with ease. The starting point is the Ski Center. From Pucón take the road towards Villarrica until a good marked crossing on km 1. The road to the volcano is paved for the first two kilometers, and then it becomes a wide and rough gravel road. At km 9 is the entrance to the National Park with the CONAF’s control, soon afterward you must turn right and the road begins to ascent in wide, zigzag curves. At km 15 you will reach the first ski lift called “Juncalillo”, and finally, leaving the forest behind, the road ends at the Ski Center’s parking lot (km 17). From Pucón it is an about 30 minute-ride, with no public transportation, but it is possible to hitchhike. 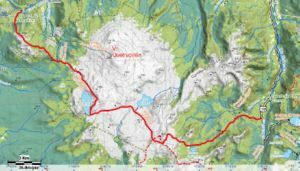 The trail Challupén – Chinay starts in the last curve 200 meters before the Ski Center. There is a big informative sign with a map. Here we are above the limit of the forest, and the landscape is very sterile, but there are still some spectacular views towards the smoking volcano. After 10 minutes we cross a wide ravine, “Zanjón Correntoso”. The cracked lava, almost black, belong to the last eruption of the Villarrica in 1984. Twenty minutes later we get to the “Zanjón Molco”, a ravine which goes all the way down to the lake, half road between Pucón and Villarrica. Then the path begins to slowly climb until getting to the mark of the 1.550 m.a.s.l, which we will keep during the next half hour. This area of lava, barren dumps is the highest of the trail. Finally we get into an area with a characteristic high land grass and the trail descents towards a small lenga forest, which we reach 30 minutes later. Due to the high land climate and the rocky soil, the lenga grows small. Soon afterward the trail gets down to a deeper ravine, “Zanjón Voipir”. Normally it brings melted water, which comes from an impressive hanging glacier, but for the amount of ashes it has, the water is muddy and not good for drinking. Leaving the Zanjón Voipir behind, the trail enters again the forest, which turns thicker the more we go into it. The first araucarias appear, still small, and later they give place to huge and ancient specimens. After the rocky first part of the road, it is nice to walk again over soil and hear the sounds of the forest. Shortly afterwards there is a fork with a wooden sign that announces “A Villarrica”. The trail Challupén continues to the left and soon descents to another big ravine, the “Zanjón Pino Huacho”. An arrow indicates “Agua 30 mts” to the right, where in the rocky wall of the canyon appears a water spring. It is the only possibility to find safe water in the first leg of the trail. There is enough room to pitch a tent if needed be. The path continues steep uphill to get out of the ravine and enters the forest again. You can see several alternative paths in this area, but they are less marked than the main one. The people of nearby towns come here in the fall to collect piñones, the fruit of the araucaria tree. About 30 minutes after leaving Pino Huacho behind we arrive to another fork with a sign to Lican Ray. Immediately after that we arrive to Zanjón Challupén, wider than the previous ones. The eruption of 1971 came through it with a slide of mud, stones and melted snow that went all the way down to the lake Calafquén. The trail gets down to the bottom of the ravine and crosses it in diagonal uphill. The way out is not easy to find, you must continue through the dry river bed for another 500 meters until you see on the south side some darker lava rocks where the next stake (Nº 38) is. The path continues for another 400 meters towards the volcano and then turns 180 grades and keeps on climbing the wall to get into the forest again. Shortly ahead there are the “Laguitos de Challupén”, two small ponds of 10 to 15 meters diameter. It is stuck water without a clear inlet, not recommended for drinking. It is a good place for a picnic and in case of an emergency it is also possible to pitch a tent. The path continues slowly uphill through a lush forest to cross 30 minutes later a small valley with a brook. On its south shore there are plain places to pitch tents, although there is no shadow. If there is water running in the brook, this is the best option for a camp site, if not, you have to continue for 15 minutes. From the Ski Center there are in all about 4 to 6 hours walk. The trail continues for another 15 minutes through the forest until arriving to the Estero Ñilfe, pointed out with a wooden sign. Now the view to the south is clear and it is possible to see the double volcano Choshuenco/Mocho. Some trekking guides recommend this place to pitch a tent, but it seems that there is only water in the afternoon, when the snow melts. After the Estero Ñilfe begins the “Valle del Fuego” (Valley of the Fire), a wide area of recent volcanic activity. Impressive are the fields of “corded lava” which acquired this strange look due to the flatness of the terrain and the density of the magma when it cooled out. The creases look like roots or twisted strings. In the volcanic dumps it is not easy to recognize the path, in certain areas you must be aware of rocks that are put one on top of another, that are considered marks that show the route. The trail continues softly uphill until reaching 45 to 60 minutes after the Estero Ñilfe a pass between a secondary crater of the Villarrica and smaller hills to the south. From here there is a first view towards the Lanín volcano, which is in the border with Argentina, and with its 3.747 meters high, is the highest of the region. Now comes a long way downhill along the dry river bed of several outlets that come together and form the wide and deep “Zanjón de Coñaripe”. Through this river bed came during the eruption of 1964 the violent slide that destroyed part of the town of Coñaripe and killed 20 people. The path gets to the west shore of the zanjón just where a small ravine appears. You must follow it uphill. 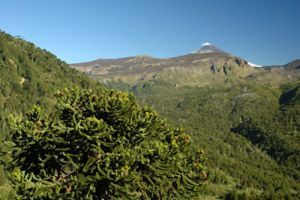 Here it is hard to see the path, but after about 300 meters, the trail continues to the right and goes towards another pass formed by a volcanic cone opened to one side and the slopes of the Villarrica itself, that you will reach after 40 to 50 minutes uphill. The path is marked with a double row of rocks on each side. Continuing over the limit of the forest, the path gets downhill crossing three small ravine. Through the third one runs the Tralco creek, and it is the first opportunity to get water after 2½ hours. 15 minutes later we get to the volcanic dump of Catricheo, an impressive field with fragmented and porous lava. Again you must be aware of the rocks on top of each other that show the route. 25 minutes later we arrive to an isolated rock which is not volcanic and that is known as the “Piedra de la Junta” (“Meeting Rock”). The path continues through a wide plain land, partially covered with high grass, which falls slightly to the southeast, towards the valley of the Llancahue River. On its borders you see wide araucaria forests. After half an hour smoothly downhill you will find the river Aihue, which runs in a wide valley with more water than the previous ones. It is not a sheltered area, but it will be OK if you are running late and must pitch a tent. While we continue to the east we get closer to the limit of the forest. Finally the path gets to a group of isolated araucarias. This area is known as Champulli. You must ignore possible paths that get downhill, which are commonly used by piñones collectors. The right trail now marked with more frequent stakes turns to the northeast, gets uphill again and keeps above the tree line. It goes around the side of the mountain and crosses, keeping the height, several dry ravines that fall abruptly into the valley. After walking for 30 to 40 minutes from Champulli we arrive to a small hill where the path finally enters a lenga forest. Then it comes a long and steep part downhill that lasts over half an hour, until reaching the river Pichillancahue, at the bottom of a small valley. There is a new foot bridge to cross it. Its waters come from the name’s sake glacier, and that is why it has more water on warm afternoons. Due to the volcanic ashes, it is usually not clear, but most of the big particles precipitate to the bottom if you just leave a bottle to rest for a little while. On its east shore there are good places to camp bellow ancient trees. It is a good option for those who want to continue with the Villarrica Traverse. There are about 4½ to 6 hours walk from the suggested campsite before the Ñilfe creek; to get to the official CONAF’s campsite in Chinay there are still 1 to 1½ hours left. From the Pichillancahue the path continues for some minutes down river, and then turns and starts a short ascent in order to get out of the valley. 15 minutes later it comes together with the public road that goes from Coñaripe to Palguín, across the National Park. It is in pretty bad shape, and a four-wheel-drive vehicle is a must. Continuing downhill, you will get after 2 kms to the limit of the park, in 6 kms to the Hot Springs El Rincón and in 24 kms to the town of Coñaripe. There is no regular public transportation. The road uphill reaches in 2 kms (30 - 45 minutes) the start of the trail Pichillancahue and Los Nevados, and soon after the pass from where the road downhill to Chinay starts. There are another 2½ kms to get to the campsite of CONAF and 4 kms to reach the rangers’ office. From the Ski Center until the end of the path in the public road Coñaripe – Palguín there are 29 kms with 905 m total ascent. With light luggage it is possible to do it in one day (9 to 11 hour-hike) if you have organized the transport to take you back. More common is to do it in two days camping half way, or taking it as the first part of the Villarrica Traverse, which takes between five to six days. With the proper luggage you must calculate with two days of 5 to 7 hours walks. The beginning of the trail is well marked, and starts about 50 meters before reaching the CONAF’s rangers’ office. Through a catwalk you must cross the Chinay River and then we get closer to the mountains on the other side. After 30 minutes the trail starts to climb a mountain slope with continue zigzags. Take it easy, the climb is very long, and there are about 700 meters to gain. The forest is mixed, with raulíes, coigües, colihues and many notros which in springtime bloom fire-red. 15 minutes later the first araucarias appear. Soon you will have the first views towards the valley of Palguín Alto, and the Villarrica volcano with the Pichillancahue valley on the other side. Farther ahead you will find a sign that indicates that there is water 20 meters downhill; even though the access is not easy, it is better to get some here, since the next chance to find clear water again is several hours ahead. After 1½ to 2 hours walking you will reach the limit of the forest. There is still some coirón, the typical highland grass, but it becomes scarce. Now the land gets more desert-like and you will find a rather thin thread of water, but it is not safe. Soon the trail turns into a pass, but instead of getting downhill, you have to turn right and keep on climbing; some stones in a pile will confirm that you are on the right track. At this point there are usually strong winds that make it hard to walk, especially if the “Puelche” is blowing, a very strong wind that comes against you from Argentina. The trail continues along the left side of the summit of Cerro Los Pinos, and then along the edge of the Mocho Range, going up and down all the time. There are some rocky parts that take turns with areas of stubby lengas. The views are great: Towards the north there are the volcanoes Llaima, Tolhuaca and Lonquimay, in front there is the Quetrupillán volcano, and farther, the impressive Lanín. To the left you can see the valley of the Mocho River, much devastated by forest fires. Here there is an alternative entrance to the estate “Paraíso Escondido”, which avoids the steep climb to the Mocho Range and shortens the first part in a couple hours, but does not have the views and sensations of the original trail. About half an hour after having reached the highest point next to Cero Los Pinos, the trail gets downhill and enters into a thick forest. Finally it gets to the bifurcation where it meets with the Mocho Trail. From the Conaf’s rangers’ office to this point there is an about 3 to 4 hour-walk. From this union, the trail starts to gently climb and reaches the limit of the forest in half an hour. Here you have to cross some outlets of the Mocho River, but in the dry season they are practically empty. In some travel guides they recommend to camp here, but we don’t think it is a good place to do it. However, if you want to do the ascent of the Quetrupillán as a part of the Villarrica Traverse, this is the area where you get the closest to start it. After leaving the forest behind, it begins a long part with a gentle climb along the slopes of the Quetrupillán, making a wide turn to the south. To the right there is a bizarre rocky peak– the remains of an ancient volcano. After about 20 minutes we cross a crystal-clear creek, and 15 minutes later we arrive to a meeting of another two, which actually originate the River Llancahue that runs all the way down to Coñaripe. Immediately afterwards there is a bifurcation: if you continue straight ahead there is the "Colonia Benavides" Trail which connects with the gravel road Palguín – Coñaripe near the Hot Springs El Rincón. It could be used as an “emergency exit” if you don’t want to continue in case of bad weather. Next to the bifurcation there is a plain ground where you can pitch a tent if it is not too windy. The main trail here turns to the southeast and starts climbing again. With good visibility you can see from afar the route between the mountains and the pass we will have to reach. 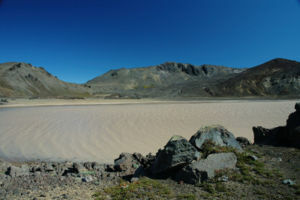 After another hour walking and an exhausting climbing, you will notice a depression between two mountains, but it is still not possible to see the Laguna Azul there. The trail gets away and climbs a bit more; here we reach the highest point of the whole trail. Now there is a long way downhill to get to the goal. 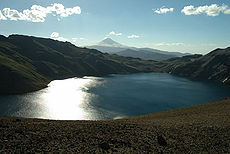 While going downhill you can notice several volcanic craters and the lava flow that formed the plug that originated the Laguna Azul (some maps call it Laguna Los Patos). After another hour, at the end going in zigzag, we reach the shore, next to the outlet. In a small lenga forest there is enough space to pitch a tent. If there are too many people and the best places are gone, you can cross the outlet and walk through a path for about 5 to 10 minutes until it gets downhill and approaches to another river. Through this route it is possible to get down all the way to the Liquiñe valley, few kilometers ahead it turns into a wide road for four-wheel-drive vehicles. Several Chileans use this road when they come to fish or make a picnic at the Laguna Azul. This lagoon, with its deep blue waters, narrowed between desert-like mountains, is an overwhelming experience. Unfortunately its surroundings have been seriously deteriorated in the past years. The small forest is almost completely littered by all kind of garbage, and visitors without ecological conscience cut the twigs to make fire. Continue the march between the mountain you used to arrive here and the lava flow that plugged the lagoon. Few minutes later the trail crosses a much eroded lava field, formed by big volcanic rock chunks. After a short climbing you have to cross another arm of the same lava tongue. To the left, at the slopes of the Quetrupillán, you can see the crater partially open from where the eruption came. 40 to 50 minutes later we reach a pass, and a wide volcanic dump area appears ahead of us. However, the trail turns to the southeast getting gently downhill towards a wide ditch. Through the middle of it runs a thin river. Even though its waters carry a lot of sediments, they still could be OK for drinking if you let them set for a while. Each time the river grows, there is a chance that the trail gets erased, but a line of stakes indicate the route at the bottom of the ditch towards the west side where you can see a small climbing towards another pass. From the top it is possible to see the Laguna Blanca. Getting down there is a small spring that manages to create a green spot with surprising plants amidst the dryness around. 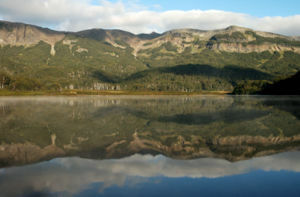 The Villarrica Traverse passes half kilometer away of Laguna Blanca. There is no sign, but you can notice a path that leads there. It is a well-worth detour. The milky colors of its waters, along with the dark rocky formations on the shores, create a unique landscape. On the top you can see the south side of the Quetrupillán, covered with wide glaciers, meanwhile its west side has not always snow. It is possible to camp at Laguna Blanca. It is not the best place though, but people who want to make the whole excursion in only tow days, can stay overnight here. From Laguna Blanca the trail continues to the south, going along the dry riverbed of a long ravine. To the right there is a volcanic cone with a deep red color. All the ground is covered with sediments of previous eruptions. In the neighboring mountains there are stripes of rocks, remains of ancient volcanic calderas. After half an hour we turn to the east and start to climb the slope, passing along the right side of a tongue of solid lava. Once on the top, you will realize that you have climbed the edge of a big crater. At the back you can see the Quetrupillán and, for the last time, Laguna Blanca. In this part another trail comes together, the one that comes from Rinconada, but it is seldom used and not very well marked. We continue walking still very high through the slopes of a mountain range heading south-southwest. From here you can see the upper valleys of Liquiñe, covered with thick forests, and the volcano Mocho-Choshuenco at the back. Then the trail turns east and we enter into Argentinean territory for about 2 kilometers (be aware that some maps don’t show this part of the trail correctly). In this area you will gently go downhill and cross two crystal-clear brooks, the best water you will find on the second day, then you will have to climb on the other side to get to the next pass and enter Chile again. At this point, a fantastic landscape opens before your eyes, with the Lanín volcano and the Peinetas mountains, the Quinquilil and all the valley of River Puesco. To our feet there is a wide plain ground covered with grass and some stuck-watered ponds. The trail continues along the left side to the north, approaching a cliff. Through big loose rocks you get downhill to another marsh-like plain ground you have to cross towards southeast. Stubby lenga forests grow isolated in the driest zones. We cross several brooks that serve as outlets to the plain grounds and originate the River Puesco. Then the trail continues through a rough hill that separates two valleys. From here it is possible to see the Avutarda Lagoon in the background. Soon afterwards we enter the forest and it gets easier to continue downhill. Half an hour later the trail gets out of the forest and crosses another marsh area that goes all the way to the shores of the lagoon. To complete this second part of the trail you have to go again into the forest and continue along all the north shore of the lagoon. Through the foliage you can distinguish a sandy beach on the east side. To get there you have to take the trail to a clearing covered with grass, where remains of old fires indicate the camping area. Through the bushes you can get to the lagoon, and take some water. Unfortunately, this area has also a lot of garbage. The Avutardas Lagoon (in some maps it is also called “Laguna los Patos”) is surrounded by mountains on three of its sides. It has a lot of vegetation on its shores, save the part with marsh where the outlet is. Its name is a local voice for two families of geese –Caiquén and Canquén- which usually nest in this marsh. Including the detour to Laguna Blanca there are 16,9 kilometers with a total ascent of 520 meters. Carrying a backpack it will take you 5 to 6½ hours. To the end of the trail in the Camino Internacional there are 8,4 kilometers with a total ascent of 170 meters and 660 meters downhill in all. Carrying a backpack it takes about 2½ to 3 hours. To the CONAF’s rangers’ office in Puesco there are another 3,4 kilometers with a total descent of 370 meters, and about 1 hour-walk . 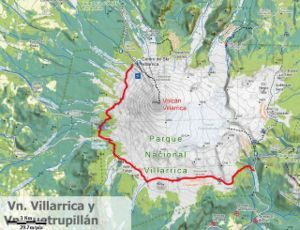 CONAF charges an entrance fee of Ch$ 5.000 to Chileans or Ch$ 7.000 to foreigners for using the"Villarrica Traverse". It is possibly to hire the agency Travelaid, based in Pucón, to do this trekking with qualified guides.